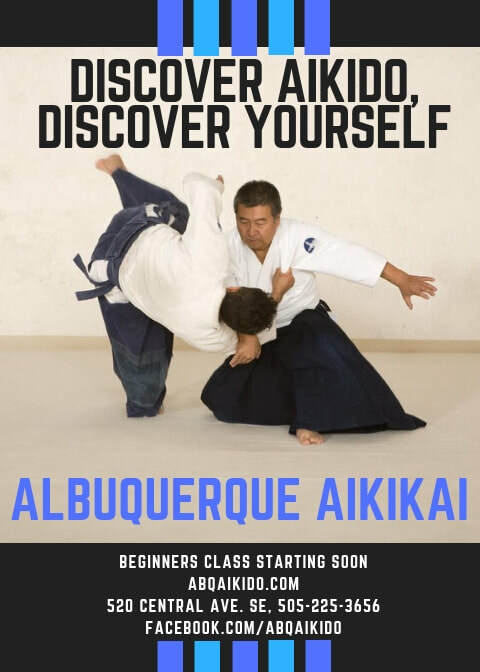 ﻿﻿Albuquerque Aikikai offers an introductory 8-week course for adults several times each year. This is an ideal way for new people to learn the basics of Aikido or for returning martial artists to refresh their knowledge. The course covers body positioning, forward and backward rolls (ukemi), and basic attacks and techniques. Classes are held on Tuesdays and Thursdays from 5:30-6:30 pm. The $100 fee includes 16 classes and a lightweight training uniform. You may upgrade to a heavy gi for an additional $25. Stop by the dojo to register, or fill out our online registration form. You may then return to this page to pay through PayPal or come by the dojo to pay in person and collect your uniform. If you missed the start of beginners class, there may still be time to join us. If you have previous martial-arts experience and are interested in starting before the next basics class, please contact us for more information. We also offer classes for kids on Tuesdays and Thursdays from 4:30 to 5:20 pm.